The only house on the sand in Chacala. Our HOME along with the attached CASITA can accommodate up to 11 people. See VRBO 894608 for additional information on the casita rental along with a search on info on Chacala Beach House. The location is ideal for families and those that love the convenience of walking out the door onto a beautiful white sandy beach. Rent all of the house and the casita or just the house or just the casita. The photo gallery shows you recent photos of the 3 bedroom house and 1 bedroom casita with the roof top patio. The last few photos on the slide show are the casita. *Price can be discounted based on VRBO payment method. Both Beach House and Casita can be rented together or individually. Please email me with the dates you are interested in reserving and I will get back to you quickly. Opportunities to see more info on the property is available for Chacala Beach House. The house is rented as a 3bdrm/3 bath home. The house and casita are great for family reunions, multiple couples or families. Sleeping can be arranged for up to 11 people. The casita is one bedroom, with living room and fully equipped kitchen and can be rented by the week for $1290 up to 4 people. All bedrooms have Queen size beds and additional portable beds can be added. The Nayarit coastal town of Chacala is unique: year round velvet green jungles and mountains, white sandy beaches, clean blue ocean water, lush and varied plant life, ecological convergent birding zones, twelve months of SURFING, and abundant fishing and snorkeling. Chacala sits overlooking secluded Chacala Bay, surrounded by palm trees dotted with palapa restaurants. There are only about 400 residents in the village. Chacala Bay Beach House is for the visitor who wants to stay right on the beach, stepping from the patio to the sand. Families find the convenience of being right on the sand a great bonus. When you are right on the sand all the beach and sand toys along with outdoor shower, shaded palapa and a kitchen for beverages and meals are a great convenience. Claudia and Roberto are a daily help and enjoy meeting the guests and helping to make the stay comfortable and easy. All rooms of the Beach House present themselves to the ocean. The sea breezes flow throughout. All view bedrooms have a queen size bed for the visitor to enjoy the views while sipping coffee in the morning. Dining can be inside or at the outside patio which can accommodate 10. The casita is a garden view and mountain view. It has a roomy living area with a full kitchen. The roof top patio is for the casita guests. Claudia and Roberto will also set up chase lounges for use on one of the beach palapas. Those renting the house should ask Las Brisas Restaurant and Ysidros about delivering meals to the patio of the house. The living and dining room host tables and chairs. The kitchen, like all rooms, overlooks the bay. The large lot is entirely enclosed with secured parking. Under the large patio palapa House guests will enjoy afternoons in the hammock and lounge furniture. The private beach area features 2 palapas for shade. One palapa for the house guests and the other for the casita. The Beach House has an onsite property manager couple, Claudia and Roberto, who are there to assist and do housekeeping maintenance. Roberto can be hired to take you to the surf area, fishing, ocean touring and snorkel areas. Claudia will make sure your living area is cleaned daily and will help make your stay comfortable. Chacala also offers opportunities for volunteering. Recent guests have helped with landscaping projects at the schools, brought art supplies for childrens' projects and been available for tutoring. If you wish to improve on your Spanish language skills, teachers are available for hire. Many guests also bring items for the children which are distributed at the Chacala Beach House Natividad Fiesta in December. Voluntourism is adding to the experience of vacationing in Chacala. If you wish to travel in the winter months, please book early as those times are reserved quickly. We traveled for many years throughout Mexico and Latin America looking for the perfect beach. We knew our search was over when we arrived in Chacala for the first time in Oct. 2001. It was love at first sight. In addition to surfing, swimming, hiking, fishing, whale watching, we have loved being involved with the community via the schools and hosting an annual Christmas (Posada) event, in which all children are fed, given a toy and an afternoon of song and fun. NGO's from the US have used the property to host retreats and conduct community programs. As you can see from Chacala Beach House, our vacation home has been a joy to share with many. When researching Chacala Beach House you will see that the there is Great surfing just a quick boat ride away! This home with casita is situated on the beach in the small fishing village of Chacala, 60 miles north of Puerto Villarta. Swim in the bay, hire boats for whale watching excursions, hike to the rain forest and explore a true slice of wonderful Mexico. The property is great for reuniions and family gatherings. A great place for a Yoga Retreat, wedding and reception. On the beach with great access to exploring areas away from the ocean. This village was featured in past US travel news articles. Want a vacation from the kitchen? Set up a meal delivery with Las Brisas Restaurant. Meals can be delivered to your Chacala Beach House patio. Las Brisas is renown for their fine Mexican cuisine and serving you at Chacala beach house. 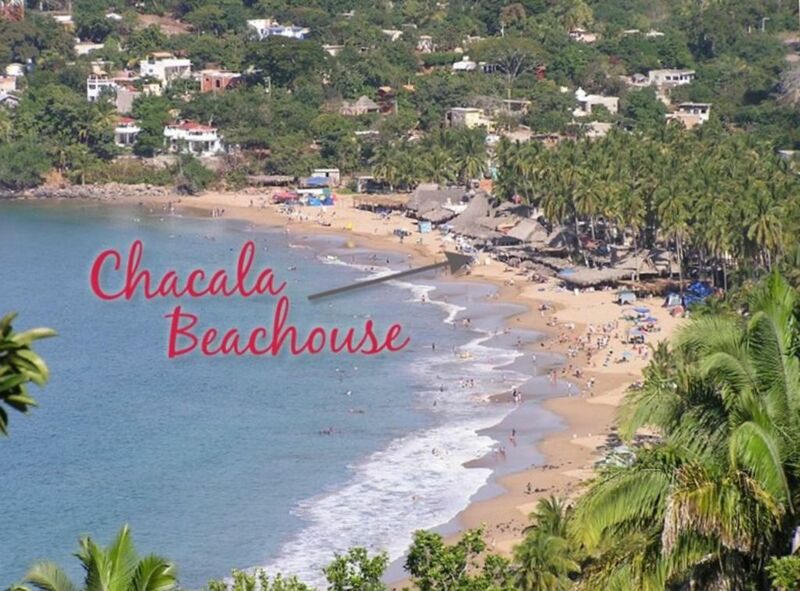 Chacala Beach House is a family owned home that appreciates quality and provides daily service. We recommend your cell phone have a Mexico plan. Each bedroom has an air conditioner. The casita has ac in the bedroom and living area. We have WiFi and Internet. Password will be given when reservation is confirmed. Outdoor covered patio area is the main dining area. There is a table and chairs inside. Please Bring lap tops or viewing devices for videos. Keep your electronics inside the house. Roberto can be hired for fishing, whale watching, and other boating outings. Claudia will be available daily to clean and help with household questions. Chacala is a quaint fishing village. Roberto, Claudia's husband, can be hired for a variety of boating experiences. If you wish to volunteer in the village we can connect you with opportunities . The best place in Mexico!!! Perfect for beach lovers ! “ Truth Teller”! Chacala Beach House and Casita is a very special place and we are thrilled you had a wonderful time! We will look forward to seeing you again! We had an amazing holiday at the Chacala Beach house. As two families we wanted the convenience of an all inclusive on the beach but with flexibility for food and excursions. We found it ALL for kids 3-13 years old with interests ranging form boogie boarding, sand castle building, swimming, fishing, hiking, volley ball, and just hanging out. Location - right on a beautiful beach (nicer than Sayulita's) with amazing sunsets and unlike most other houses in Chalcala, just outside the compound gates are groceries, tortilla-ria, juice bar, surfer pizza (they deliver!) - everything you need. All of the locals are really friendly without being pushy and accommodate those without Spanish with friendly smiles. We ran a tab with the restaurant next door to have nachos and beverages delivered in the afternoon, breakfast buffet and great dinners at affordable prices and they take credit cards, otherwise bring pesos. Or choose to eat in and the owners insist you let Claudia, the daily housekeeper, do ALL of the dishes. House - right on the beach with great sunset view and we felt very safe and comfortable with the indoor and outdoor layout. Beds are comfortable, rooms are spacious and each have an en-suite . Sleeping arrangements are flexible, but each bedroom opens and locks to the outdoor compound area. So, with young children who need night access to their parents the casita is perfect with 1 bedroom, plenty of sleeping space for 3 children and a kitchen. Main Kitchen is small but comfortable, outdoor dinning space is great, good lounge chairs, but no couch or lounge zone inside. We loved that the house came with beach towels, boogie boards, beach toys and private palapas on the beach. Activities - we did excursions every other day including hiking the local volcano, fishing with Roberto (caught 3 yellow fin tuna in 2 hours! ), hike to petroglyphs, local market day at la Penita and a great trip to San Blas to take a river tour to see crocodiles, birds, turtles followed by a swim - all were fun for all ages and very chill. Transportation - as a group of 9 we highly recommend contacting Trini's Shuttle Service. Juan met us at the airport, took us on all the excursions on our time and had lots of local knowledge and advice including great inexpensive restaurants and all without the "tour" feel. The convenience was amazing and the cost was less than renting cars / van. Fun village, great beach and plenty to do - without the hassles of crowded all-inclusives. Thank you for taking time to write a thorough review. I am so pleased you and your family saw the beauty of Chacala's landscape and people. I hope Chacala will see you in the near future. This review is primarily for the La Casita apartment rental. We spent one week at the beach house and loved every minute! Las Casita is well-appointed, comfortable and the location is utterly unbeatable. The apartment was perfect for our little family. Claudia and Roberto, the caretakers, are onsite and extremely approachable and helpful. Chacala beach is great for young kids, and while Chacala is small, it has enough tiendas and restaurants for most needs. We also had the good fortune to meet the owners, who are extremely kind and genuine people. I would highly recommend this property for people who are looking to spend their time on a lovely beach without a whole lot of distractions. There are lots of options for things in the area which are best reached by a rental car. Family life and the Mexican charm of Chacala was a perfect match for you.. We were thrilled to see you enjoying life under the palapa, bobbing in the bay and exploring the village of Chacala. You added to the joy of the casita. We hope future vacations will find you and your family at Chacala Beach House and Casita. Hasta luego and keep in touch. What a great location! Relaxing, friendly staff, clean sandy beach. If you want to get off the beaten path, this is it. The hiking was beautiful, snorkeling was nice, swimming in the ocean was OUTSTANDING! The beach is definitely swimmable and very child friendly as it is pure sand with virtually no rocks, shells, or seaweed! The house is centrally located, clean and well appointed. We thoroughly enjoyed Claudia's daily cleaning of the place and her friendly, helpful attitude. We loved Chacala and the people we met. Xplore Chacala taught our son how to surf and guided us on a hike through nearby petroglyphs. Great get away and beautiful home and town! We just arrived home to snowy Canada after spending a week at this beautiful beach house. We had been to Chacala on day trips via boat before, but decided to spend a week here this time around and I'm really glad that we did. We spent most of our time enjoying the private beach area and the huge patio. We found there was no need to cook as it was just the two of us and the restaurants that surround the property were really good and would deliver directly to us if we felt like staying in. Claudia and Roberto were really great to have on site. We also toured the new one bedroom apartment and were impressed by its size and modern appliances. We will definitely be returning. Jungle river excursion in San Blas, Puerto Vallarta for Shopping is 60 Miles South, distillery tours in the village of Tequila, street fair La Pinita, hire Roberto for seasonal boat tours such as whale watching, snorkeling, fishing. Upon confirmation of the reservation, guests will receive an emailed list of attractions with directions. As there can be some flexibility with the amount of days rented. There is different pricing for the home based on the amount of bedrooms and people that will be occupying the home. The maximum bedrooms and bathrooms in the home is 3 and can accommodate 6-7 people. The apartment is a separate unit on the property; just completed in winter 2014 and rents for $1250 a week for 4-5 people. It can be rented for long term with a discounted rate. Call the owner.